Below you will find a portion of the North Carolina Vacation Rental Act, the purpose of which is to "enact laws regulating the competing interests of landlords, real estate brokers, and tenants" in regards to the vacation rental industry in North Carolina. Sun Realty is happy to make this information readily available to our guests. To view the Act in its entirety, please CLICK HERE. 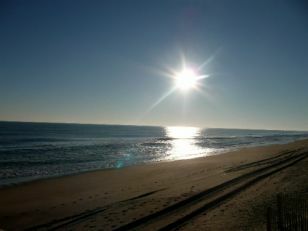 Sun Realty's Outer Banks vacation rentals fall under the juristiction of the North Carolina Real Estate Commission and North Carolina real estate laws and legislation. Your Vacation Lease Agreement is subject to the terms and considerations of the NC Vacation Rental Act. The terms of the NC Vacation Act are shown below. For the purposes of your Sun Realty vacation, the terms Guest and Tenant are interchangeable. 42A‑2. Purpose and scope of act. (a) The provisions of this Chapter shall apply to any person, partnership, corporation, limited liability company, association, or other business entity who acts as a landlord or real estate broker engaged in the rental or management of residential property for vacation rental as defined in this Chapter. (1) Lodging provided by hotels, motels, tourist camps, and other places subject to regulation under Chapter 72 of the General Statutes. (2) Rentals to persons temporarily renting a dwelling unit when traveling away from their primary residence for business or employment purposes. (3) Rentals to persons having no other place of primary residence. (1) Real estate broker. - A real estate broker as defined in G.S. 93A‑2(a). (2) Residential property. - An apartment, condominium, single‑family home, townhouse, cottage, or other property that is devoted to residential use or occupancy by one or more persons for a definite or indefinite period. (3) Vacation rental. - The rental of residential property for vacation, leisure, or recreation purposes for fewer than 90 days by a person who has a place of permanent residence to which he or she intends to return. 42A‑5 through 42A‑9. Reserved for future codification purposes. Article 2 - Vacation Rental Agreements. § 42A‑10. Written agreement required. (1) The tenant's signature on the agreement. (2) The tenant's payment of any monies to the landlord or real estate broker after the tenant's receipt of the agreement. (3) The tenant's taking possession of the property after the tenant's receipt of the agreement. (a) A vacation rental agreement executed under this Chapter shall contain the following notice on its face which shall be set forth in a clear and conspicuous manner that distinguishes it from other provisions of the agreement: "THIS IS A VACATION RENTAL AGREEMENT UNDER THE NORTH CAROLINA VACATION RENTAL ACT. THE RIGHTS AND OBLIGATIONS OF THE PARTIES TO THIS AGREEMENT ARE DEFINED BY LAW AND INCLUDE UNIQUE PROVISIONS PERMITTING THE DISBURSEMENT OF RENT PRIOR TO TENANCY AND EXPEDITED EVICTION OF TENANTS. YOUR SIGNATURE ON THIS AGREEMENT, OR PAYMENT OF MONEY OR TAKING POSSESSION OF THE PROPERTY AFTER RECEIPT OF THE AGREEMENT, IS EVIDENCE OF YOUR ACCEPTANCE OF THE AGREEMENT AND YOUR INTENT TO USE THIS PROPERTY FOR A VACATION RENTAL." (1) The manner in which funds shall be received, deposited, and disbursed in advance of the tenant's occupancy of the property. (2) Any processing fees permitted under G.S. 42A‑17(c). (3) The rights and obligations of the landlord and tenant under G.S. 42A‑17(b). (4) The applicability of expedited eviction procedures. (5) The rights and obligations of the landlord or real estate broker and the tenant upon the transfer of the property. (6) The rights and obligations of the landlord or real estate broker and the tenant under G.S. 42A‑36. 42A‑12 through 42A‑14. Reserved for future codification purposes. Article 3 - Handling and Accounting of Funds.